If you have children in your life, here is a fun giveaway for you! 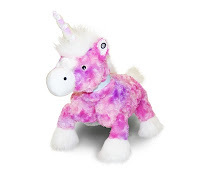 Bonkers4coupons just recently had a honor to do a review of Uriel Unicorn Blanket Pet. You may click here for the full review. Now a lucky fan will get a chance to win one of their choice. This Giveaway will run from July 21st 12a - July 30th. You must be a resident of the US to be qualified to win. Now all you need to do is enter the rafflecopter below. Disclaimer: Bonkers4coupons will not be held responsible for shipment of this prize. This prize will be sent directly from Zoobies. Thank you and Good Luck!